An emotional reunion game spilled over to the hallways after the Los Angeles Clippers defeated the Houston Rockets 113-102 Monday night at Staples Center, giving LA their fifth win in a row, as well as lifting them above .500 for the first time since Nov. 4Houston's James Harden, Chris Paul, Trevor Ariza and Gerald Green reportedly pushed into the L.A. Clippers’ locker room looking to confront Austin Rivers after a discussion took place from the sidelines in the fourth quarter. Paul, the former Clipper who spent six seasons in Los Angeles, led his teammates into a hallway that was connected to his former team's locker room, where the four Rockets players were not pleased with how the game ended. The Houston players were eventually stopped short after security was called, as Rockets center Clint Capela even stood outside of the Clippers locker room but was denied entry at the door. Clippers coach Doc Rivers expressed to the media following the altercation, that his players were right where they were supposed to, which was in their own locker room. 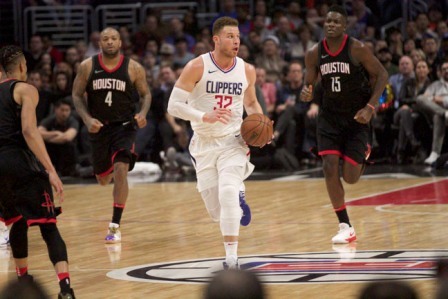 With three-and-a-half minutes to play in the fourth and the score in favor of the Clippers, Blake Griffin scored under the basket over Paul, where a foul was assessed on Paul as well. Rockets coach Mike D'Antoni was livid with the call and expressed his emotions towards Griffin, as the two furiously yelled back and forth, while D’Antoni and Griffin both received double technical fouls. Now with 1:12 remaining in the game, hustling to save the ball from going out of bounds, Griffin threw the ball directly off of Rockets guard, Eric Gordon, which did not sit well with Houston. The following possession then led to more trash talk, this time coming from Rockets forward Trevor Ariza and Clippers guard Austin Rivers, who was sidelined because of an injured ankle and sitting on the bench. The two exchanged words before Blake Griffin made his way to Ariza, as they got in each other faces, turning into a shouting and bumping match between the two players. Right away both players were assessed with double technical fouls, which meant ejections for both Griffin and Ariza, as Griffin left the court tossing his jersey into the crowd showing emotion as the score sat at 113-100. The big story of the night was what really took place between the players in the locker room and Griffin let it be known that his teammates were not in the wrong. An actual basketball game did take place Monday night, even with all the extracurriculars that took place throughout the night. Lou Williams led all scorers with a game-high 31 points and nine assists, while Griffin added 29 points, 10 rebounds and 6 assists. Chris Paul, finished with 19 points and 7 assists in his emotional return to Los Angeles and was honored during the first timeout of the game. A video tribute of his Clippers highlights took place in the first quarter after a timeout, as fans cheered on their former historic point guard. “Thank You CP3,” was how the video ended as, Paul waved and accepted Staples Center appreciation. One person who did not care for Paul’s return was Clippers coach Doc Rivers, as their relationship was rumored to be not the greatest during his departure. Stifling defense from Los Angeles was on display throughout the game, holding Houston to 40.4 percent from the field and even 29.5 percent from the three, converting on 13 of 44 three-point attempts. Los Angeles on the other hand had an extremely efficient shooting night, converting 55.7 percent from the field, also racking up a total of 30 assists, as everyone seemed to have an unselfish mindset. All in all, emotions were high for Clippers players like Lou Williams, Sam Dekker and Montrezl Harrell, individuals who were all dealt from the Rockets in exchange for Paul. Suspensions or at least fines are most likely imminent in the ongoing week, as the NBA will go through a thorough investigation that dealt with the players invading the Clippers locker room following the game.